It was cold as it gets, that early February morning on the North Atlantic. The USAT Dorchester was en route to Greenland, carrying nearly nine hundred U.S. soldiers on their way to the European theater. The Dorchester was part of a convoy of Navy and Coast Guard vessels: necessity for the grim threat of the German U-boats. The Dorchester was struck by torpedo just before 1 in the morning. The ship began to take on water fast, and a frantic chaos ensued in the desperation to escape. Among those aboard were four United States Army chaplains. George L. Fox was a Methodist minister. Alexander D. Goode was a Jewish rabbi. Carl V. Poling had served as a Baptist and Church of Christ minister before being ordained in the Reformed Church of America. John P. Washington was a Roman Catholic priest. As the Dorchester descended into the frigid waters, the four chaplains - Fox, Goode, Poling, and Washington - did what they could to evacuate the men in a calm and orderly fashion. Unfortunately there were not enough life jackets immediately available. The four chaplains each gave up his own life jacket. The four continued to help soldiers and sailors into the lifeboats. Of the 903 personnel aboard the Dorchester, 230 were rescued. Fox, Goode, Poling, and Washington remained aboard the ship. The last that anyone saw of the Four Chaplains, they had joined arms with each other. Those in the lifeboats heard the singing of hymns and joyous praise from the four men. In the final moments of the Dorchester those who made it off the doomed ship reported hearing prayers - in English and in Hebrew - from where the Four Chaplains stood. Moments later, the Dorchester disappeared below the waves. The Four Chaplains went down with her. The Four Chaplains, depicted in a stained-glass window of Memorial Chapel, United States Army War College, Carlisle Barracks, Pennsylvania. And that was seventy years ago today: February 3rd, 1943. In 1988, this day was recognized by Congress as Four Chaplains Day. The bravery, honor, and filial love across the bounds of mere "religion" that Fox, Goode, Poling, and Washington demonstrated on the decks of the Dorchester would be remembered always. As well it should. 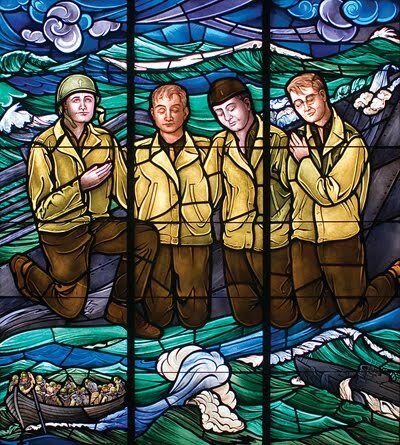 You can read more about the Four Chaplains, their lives and their story at The Four Chaplains Memorial Foundation website. Wow Chris, I am a huge WW2 History buff and I had never heard that story. Thanks so much for posting it up. And thank the Lord for such brave men.